Join us on this spectacular cruise through the pristine waters of the Pacific Northwest, aboard the 360 foot diesel powered paddlewheeler, the American Empress. We’ll maximize daytime river cruising for the best viewing of the majestic mountains, canyons and open fields. Come aboard with R&J Tours and experience memories to last a lifetime. Today we fly from Minneapolis to Portland, Oregon and meet our motorcoach for transfer to our overnight hotel in Vancouver, WA. Maybe take some time to explore a little bit of Vancouver tonight before we board our paddlewheeler tomorrow. Today we board the American Empress, proudly serving as the largest overnight riverboat west of the Mississippi River. One step onboard and you will quickly discover that there is far more to this vessel than her welcoming appearance and signature red paddlewheel. Boasting a vast collection of some of the finest historical artifacts and artwork of the Native Alaska, Russian, Gold Rush and sternwheeler eras, the corridors of the American Empress hold nearly as much beauty and intrigue as the dramatic scenery unfolding on the river outside. After settling in our cabins, we’ll enjoy exploring the riverboat, taking in the scenery around us, and having our first dinner onboard. We anchor in Astoria today, known to be the oldest American Settlement west of the Rocky Mountains. For thousands of years, Clatsop Indians inhabited the lands that are now known as Astoria. In 1805, Lewis and Clark led their expedition through the town and spent the winter at Fort Clatsop. In 1813, a British warship sailed into the Columbia River, gaining possession of the city and holding control until 1818, when they finally agreed to a joint occupation of the land. The British did not fully leave Astoria until 1846. There is no doubting that rich history has deep roots grounded in this Columbia River town. When the history combines with the scenery, it’s perfect harmony! You’ll have an opportunity to walk along the city’s waterfront on the six-mile paved Riverwalk. View the 600 foot Astoria Column, the magnificent monument celebrating early settlers of the area. Tour the historic, Flavel House, built in 1885, and one of the best preserved examples of Queen Anne architecture. You’ll also have a chance to explore both the Heritage Museum and the Columbia River Maritime Museum during our time in Astoria. On the banks of the scenic Columbia River, the city of Stevenson is our launch pad to the Washington side of the Columbia River Gorge. A stroll along the Rock Cove Pathway or the Columbia River waterfront is a great way to take in surroundings. Downtown Stevenson is home to unique shops, art galleries, and restaurants. Stevenson is in the heart of the Columbia River Gorge National Scenic Area. Explore the eastern entrance to Mount St. Helens or the spectacular Lewis River Valley. Visit the Columbia Gorge Interpretive Center, The Bonneville Dam, and Downtown Stevenson, WA when you utilize the Signature Hop-on-Hop-Off shore pass. At the end of the overland Oregon Trail, The Dalles holds a unique place in history as a jumping-off spot for pioneers, soldiers, gold miners, adventurers, gun-slingers, floozies, and scallywags. Lewis and Clark camped at this location at Rock Fort Camp during their historic journey in 1805 and 1806. Fort Dalles was established in 1850. 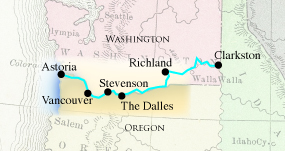 Oregon Trail pioneers ended their overland journey at The Dalles, being forced to build rafts and take the “river road” west to Fort Vancouver, then into the Willamette River valley. Ten thousand years of Native American trading took place on the banks of the Columbia River, shaped by the Ice Age Missoula floods. The town is located at the foot of a series of dangerous rapids which the Hudson’s Bay Company fur traders called “The Dalles of the Columbia.” As we dock in this fascinating town today, your Hop-on-Hop-Off pass allows you to explore the Columbia Gorge Discovery Center and Museum, the Original Wasco County Museum, the Fort Dalles Museum, as well as visit The Dalles Area Chamber of Commerce and take in some Downtown shopping. Behold the beauty of nature as we enjoy a day of scenic river cruising. Picturesque canyon walls and fascinating volcanic formations will keep us guessing as to what lies around the next bend. As we wind through the dramatic mountains and forested ridges of the great Pacific Northwest, join the Riverlorian on-deck for insightful and entertaining narration. Today we dock in Richland, located near the confluence of the Yakima and Columbia Rivers, the northern most point reached by the Lewis and Clark Expedition in 1805. First incorporated in 1910, Richland remained a small agricultural community until the Army acquired it and 670 square miles of adjacent land in 1943 as the site of the Hanford Engineer Works which was used to produce plutonium during World War II and the Cold War. Today, the historic B Reactor and other important historical venues are part of the new Manhattan Project National Historic Park. The city is also home to the Pacific Northwest National Laboratory and a branch campus of Washington State University. You can visit the REACH Museum with exhibits that teach the historical ecological and scientific importance of the Columbia River. You can also visit the 284-acre Sacajewea State Park located at the confluence of the Snake and Columbia Rivers where Lewis & Clark arrived in 1805. You will also get the opportunity to tour the Franklin County Historical Society & Museum. Our final river destination is Clarkston, nestled at the union of the Snake and Clearwater Rivers in southeast Washington, it’s the gateway to North America’s deepest gorge, Hells Canyon on the Snake River. The picturesque vistas, year-round mild climates, and a deep history make this scenic inland port a more-than-desirable stop! Spend the day following the footsteps of the historic Lewis and Clark journey – where the city received its name. 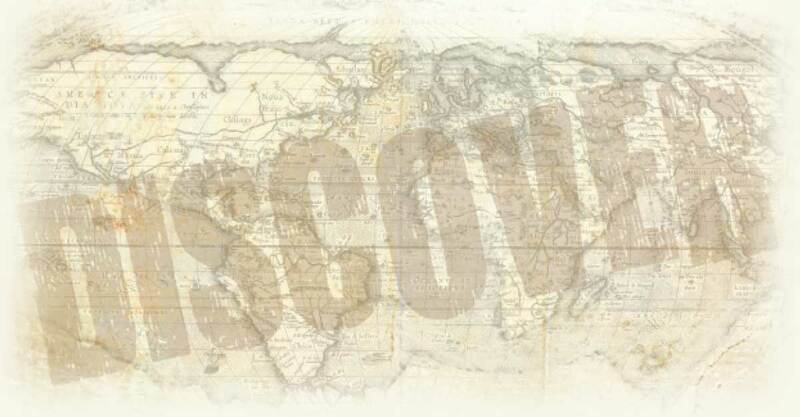 This incredible city is filled with artifacts and stories that depict the journeys of the famous explorers. Clarkston has the ideal climate for visitors to enjoy countless activities including fishing, scenic walks along the trails, shopping, and exploring! Today, your Hop-on-Hop-Off pass allows you to visit Nez Perce National Historical Park, First Territorial Capitol Interpretive Center, the 1906 Bridablik/Schroeder House, and the Nez Perce Historical Society and Museum before heading back to the paddlewheeler for our last evening aboard. Enjoy a final breakfast onboard before leaving the Empress behind. Today we board our flight for home and reminisce about our spectacular cruise aboard the American Empress! $500 deposit per person due at time of reservation. Full payment due 90 days prior to depart. DOWNLOAD PDF AT RIGHT FOR CABIN PRICING! !